second constructor inside the first one. it access to other static methods and to static fields. should be left to the theoreticians. So, if you should not use finalize( ) as a general-purpose cleanup method, what good is it? most notably your finalize( ) method, must also be only about memory and its deallocation. object. But, you might observe, everything in Java is an object, so how can this be? happen primarily through native methods, which are a way to call non-Java code from Java. method inside your finalize( ). generally unnecessary.\u201d Effective JavaTM Programming Language Guide, p. 20 (Addison-Wesley, 2001). 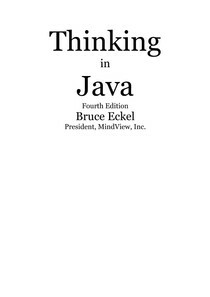 difficult to track down, and is one of the compelling reasons to move from C++ to Java.